Jason Purcell, CEO of FirstCapital, spoke at the Tech M&A Forum, run by TMT Finance, on Wednesday May 23rd. As the financing environment continues to change and evolve for technology companies in Europe, the impact on start-ups in every industry is going to be considerable. It is critical to take the time to evaluate where the market is heading and think strategically about the context in which businesses are operating, especially before diving into any transaction. 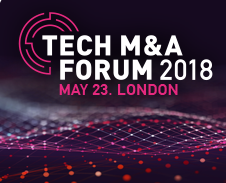 Our panel discussed these challenges, and the implications for technology M&A.